Egerton Park and Ashby Carington held a minute’s silence as the hosts remembered former Park player Phil Tomblin ahead of last Friday’s Salaman Cup tie. The tribute was made on the day of Phil’s fuineral and the club marked the occasion fittingly with an emphatic win in the 20-overs-a-side match. 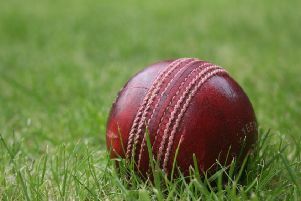 Tight bowling and excellent fielding, including three run-outs, set up the victory as Carington were restricted to 108-7 from their 20 overs. Park lost Rose early on, but 20s from Glover, Blunt and Burdett ensured victory in quick time with five overs to spare. The next first round tie takes place tomorrow (Friday) at Egerton Park when Melton Mowbray take on Bottesford. On Monday, Park are due to host the re-arranged clash between Belvoir against Tilton and Lowesby. Both matches start at 6.15pm. Ashby Carington: M. Troop 11, T. Clapham 14, J. Ainsworth 11, A. Smith 5, A. Buckby 30, T. Clapham 9, N. Lewis 7, R. Woods 0*, Extras 21. Total: 108-7. Bowling: K. Panchal 4-0-16-1; N. Watchorn 4-0-11-0; J. Blunt 3-1-13-2, J. Barnard 4-0-18-1; B. Simons 2-0-25-0; J. Woolcock 3-0-15-0. Egerton Park: S. Rose 10, T. Glover 27, C. Madden 11, J. Blunt 23*, D. Burdett 29*, Extras 10. Total: 110-3. Bowling: J. Troop 4-0-27-1; J. Kirk 4-0-29-1; J. Ainsworth 3-0-27-0; A. Buckby 2-0-9-1; R. Wood 2-0-16-0.